The price of one ounce of gold decreased by 21.896 manats or 1.06 percent last week. Accordingly, the average price of one ounce of gold stood at 2,070.5099 manats. Last week, the price of one ounce of silver decreased by 0.2008 manats or 0.77 percent. Accordingly, the average price of one ounce of silver stood at 26.21038 manats. 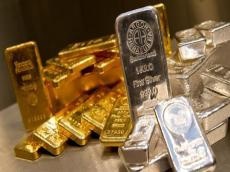 Last week, the price of one ounce of platinum increased by 0.442 manats or 0.03 percent. Accordingly, the average price of one ounce of platinum stood at 1,405.0347 manats. Last week, the price of one ounce of palladium decreased by 18.4875 manats or 1.17 percent. Accordingly, the average price of one ounce of palladium stood at 1,573.5574 manats.